Using a specially made, inexpensive and rugged heat- and motion-detecting camera, you can view wildlife up close. Camera Trapping Guide gives you the techniques and knowledge of animal behaviors so you can get the best possible photos and videos. 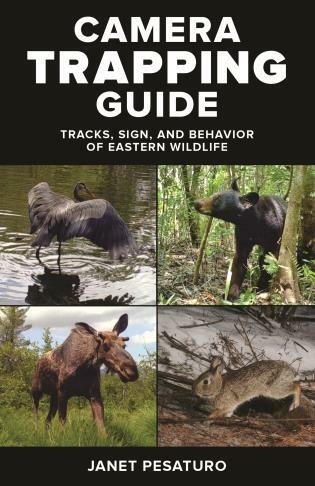 Includes 41 species common to the eastern U.S. Large and small mammals, squirrels to bears, deer, and moose, plus birds and even the American Alligator - are covered. With photos and range maps each entry gives details on physical characteristics, tracks and sign, diet, habitat, and breeding. Also included are specific camera trapping techniques pertinent to each animal. You'll learn the characteristics of various cameras, where and when to place the camera to capture specific behaviors, and how to minimize impact on the animals. Janet Pesaturo is a conservation biologist and a certificed tracker who leads wildlife tracking and camera trapping workshops. Her blog "Winterberry Wildlife" chronicles her camera trapping adventures and images. She lives in Bolton, MA.